March 2, 2017|Posted in: Healthy, Beautiful You! See Your Doctor If you’re going to make any major changes to your health routine it is always a good idea to check with your docter and get her recommendations. Everyone is different and the and the amount of food you should eat, water you should consume and exercise you should do, etc. is unique to you. Your doctor can help you set your goals for maximum health benefits. Exercise: It’s important to lead an active lifestyle. Go for a walk, turn on some music and dance, play a game of tag with the kids. Housework and gardening are excellent ways to get exercise. During summertime the activity choices are abundant. In the wintertime it takes a bit more creativity to find ways to be active. The local mall is a good place to take a walk, workout videos or dance games can be done in your living room. Recruit an exercise buddy and encourage one another to stay active! Healthy Eating: Make sure you are eating a healthy diet that includes plenty of fruits and vegetables. Fruits and vegetables should be your main goto foods when you need a snack. Eat whole grain, high fiber foods. Choose lean proteins for a lasting full & satisfied feeling. Always be careful to limit your consumption of sugars and foods that are high in fat. Water: Drink plenty of water to stay hydrated. Every part of our bodies depends upon water to function properly. So obviously dehydration can cause many health problems. Drink a glass of water first thing in the morning, with every meal and before you go to bed. Avoid soda and drinks with caffeine. Make sure your main intake of liquid is good old water! Fresh Air & Sunshine: Fresh air and sunshine are great for lifting your spirits. Spending time outdoors reduces stress, promotes physical fitness, supplies the body with Vitamin D, boosts your immune system and even improves your distance vision! So even if it is cold or hot outside, make sure you take a short walk or sit on the porch, etc to soak up some sunshine! Sleep: Get enough sleep! Many factors come into play in determining how much sleep an individual needs. Age, lifestyle and overall health all have to be considered. But if you don’t generally feel well rested chances are you need more sleep! To calm your mind, turn off the TV, put down your phone or tablet, etc. awhile before you will be heading to bed. Limit, or better yet, eliminate your intake of caffeine Most importantly, set a schedule and adhere to it. Go to bed and get up at roughly the same time each day and your body should fall into a healthy pattern of sleep and awake times. It’s Time – Take Charge of Your Health! 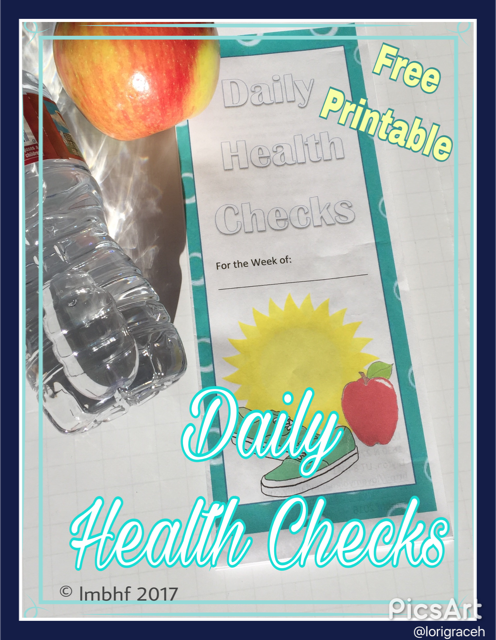 The free, downloadable Daily Health Checks printable is yours as a Thank You Gift when you sign up for the Love My Big Happy Family Newsletter. Sometimes we all need a little help getting back on track!